Zack Hample has snagged more than 4,000 baseballs from Major League ballparks. Why? BALTIMORE -- The cheat sheet goes everywhere. To the ballpark. To the bathroom. On dates. The cheat sheet folds in half, rests comfortably next to Zack Hample's dollar bills, never leaves his wallet. Neatly typed in Geneva font, it features 34 phrases in 34 different languages, written phonetically, all asking the same thing: Please throw me a ball. DAH-may la Bo-la pour fa-VOR. Spanish. CHOH-toh, boh-OR-roo oh NAH-geh-tay KOO-dah-sigh. Japanese. Nee too-PEE-eh mm-Pee-r(d)a tah-fuh-DAH-lee. Swahili. I mention that my wife speaks Khmer. Hample perks up. "You'll have to get me the translation," he says. "I'll add it. Just in case." Understand: Hample has rules, ethics, an entire self-generated moral code. No hawking baseballs from little kids. Minor league games don't count. For the cheat sheet, however, he makes no apologies. Because players have both ears and balls. Because the cheat sheet works. It's scorching, sweltering late afternoon in August, a miserable evening for a miserable game between two miserable last-place teams, the Baltimore Orioles and the visiting Oakland A's. Hample couldn't be happier. Lousy weather means fewer fans. Fewer fans means less competition. Less competition means more baseballs. Not that Hample needs them. Over the past 19 years, the 32-year-old has snagged exactly 4,166 baseballs from major league parks across the country -- fouls, home runs, waterlogged balls from the bottom of the right-field fountain at Kauffman Stadium in Kansas City -- and tonight he hopes to pad his stats. Expects to, really. Hope is for amateurs, the guys with beers in one hand and HIT IT HERE signs in the other, praying to the baseball gods, angling to catch dingers in the soft pockets of their flipped-over caps. Hample is a pro. He carries a cap for the home team and the visitors (more on that shortly). He has a streak to maintain (at least one ball per game attended since 1993), a reputation to uphold (he's written a book about ball-snagging, which essentially makes him the Dan Brown of books about ball-snagging) and an ongoing competition to win (he's currently in first place in an online ball-snagging league, and yes, there actually is an online ball-snagging league). "This is as good as it gets," Hample says. "I've considered moving to Baltimore, just to attend tons of games here. Maybe the O's will get blown out. More room for me to run." "If only it was April. There'd be even fewer fans." The sun hangs high. We're walking along the warehouse side of the stadium, across from the light rail tracks, heading toward a center-field gate. Batting practice begins shortly. Hample is ready. Ten balls, he says. At least. That's the goal. His Oriole Park career average. (And yes, he keeps track. Duh.) Hample does the math. A ball every five minutes would be extraordinary; every 20 minutes, unfathomably tragic. One ball per 10 minutes would be just about right. Only ... what about the heat? Players could skip practice altogether, robbing Hample of a prime ball-collecting opportunity. He's heard disturbing rumors from Texas, whispers that the Rangers have bailed on BP. Can a big league club actually be that cheap? I mention that I didn't bring a glove. "Good," Hample says with a laugh. "More balls for me." Hample brought a glove. Always does. A beat-up, broken-down, decade-old Mizuno, refurbished and undead. Blessed with a fold that cups baseballs just so, perfectly shaped for Hample's glove trick. The glove trick trumps the cheat sheet. It's something MacGyver might have come up with, if disarming rouge nuclear warheads required plucking balls from outfield warning tracks. Hample crouches in the stadium's shade. He wants a moment. To hide. He removes his glove from a backpack. Attached to the glove is 25 feet of string. Hample wraps the string around his hand, over and over, tucks the finished coil inside the glove. The string is a fishing line: If Hample sees an unattended ball on the field, he'll prop the glove open with a magic marker, wrap a rubber band around the outside to form a pocket, lower the glove onto the ball and reel the whole thing in like a hooked marlin. The trick has netted Hample more than 70 balls this season. He can pull it off in as little as 15 seconds. He places his glove back in the pack. "I don't want to do this in front of security and make a scene," he says. "It's not illegal. I need to be able to drop quickly and stealthily if a ball is on the warning track. Before an usher sees or a player gets to it." Hample wears a white T-shirt, brown cargo shorts (more pockets = more balls) and an Orioles cap. Inside his backpack are an Oakland cap and a matching green A's T-shirt, both awaiting a quick change, the better for Hample to lobby the visiting team for balls. Sometimes Spanish isn't enough. "Put this on, and I might be the only A's fan in Maryland," he frets. "I'm worried that players tomorrow will be like, 'Oh, yeah, he's that guy. I'm not tossing another ball. Screw him.'" We come to the gate. People say hello. People know Hample. They know his book, know his MLB.com blog, know him from YouTube clips and appearances on "The Tonight Show" and NPR. The kids at the front of the line have even e-mailed Hample, ancient Delphians beseeching the Oracle, asking for ballhawking advice. Tip: Show up early for BP. Tip: Be alert and mobile. Two lines over, a man in a yellow tank top holds what appears to be a fishing net. Wait. It is a fishing net, also yellow, used to scoop ground balls. Hample frowns. How unimaginative. How lacking in skill. "Look at this guy," he says. "Part of me is, 'Ah, that's cheap.' But then again, with all of my tricks, who am I to judge?" Every ball is a victory. Scratch that. Every ball is a freaking triumph. Because Hample is not a cute kid, the parent of a cute kid, a sweet and semi-pitiable old person or an attractive girl with large breasts. He's just some guy. He receives no charity balls, nothing dropped on his doorstep. He has to work the angles, worm his way into players' heads, use an online hit tracker to figure out the best place to stand. Go out there and get the balls, even when they're literally falling from the sky. "I'm just sort of weird," he admits. "My whole existence is strange. I'm aware of that." Hample is eating noodles. We're sitting in a Thai restaurant, a few blocks from Oriole Park, an hour before the gates open. Like a Disney Channel heroine -- or maybe Bruce Wayne -- Hample lives two lives. In the first, he resides in Manhattan. Works at his family's bookstore. Has a girlfriend. Belongs to a fiction-writing group. In Hample's second life, an old bedroom in his parents' house contains five filing drawers filled with 144 baseballs apiece ... alongside seven 32-gallon barrels holding 400 balls each. "Snagging can be a burden," he says. "On the first date? Worst thing ever. I have to hide it. It's the last thing I talk about when I'm away from baseball." Hample caught his first four balls in 1990, added 14 more in 1991. The next year, he became obsessed. He was 14 years old, with no friends and no other hobbies. Just Topps cards and playing baseball. Since Hample already rode the subway to and from school, his parents allowed him to attend games solo. He went to 80 Mets and Yankees contests, collected 128 balls. Not enough. Hample could be at the movies, a birthday party, wherever. If a baseball game took place in New York and he wasn't on hand, he emotionally shut down, distraught at the thought of missing a single ball. "My parents were deeply concerned about me for a while," he says. Hample went to Guilford, a small Quaker college in Greensboro, N.C, five hours from the nearest major league park (Atlanta's Fulton-County Stadium). The distance was intentional. He wanted to give up ballhawking. And he did. Sort of. He picked up Scrabble instead, spent an hour a day memorizing four-letter words, went scorched-earth on the dictionary until he reached the P's. Suddenly, he stopped. What are you doing? Go enjoy yourself. Hample met a girl, fell in love for the first time. He rode the bench as a freshman pinch-hitter on the school's baseball team, batting .429 (6-for-14). Realizing he would never play in the majors -- never ever -- he quit. Just like that. "I did it that instant," Hample says. "If I can't reach the highest level of something, why do it at all?" The first book brought him back. Changed everything. Published in 1999, Hample's ball-getting guide sports a cover cutline reading "more than 100 tested tips that really work," superimposed over a photo of the author clutching eight (!) baseballs in two hands. Hample looks young and earnest, slightly (very) dorky. And yet, the book took the stigma out of Hample's obsession. It made him legit. Earned him respect. Helped his parents relax. Fans began to recognize him. Ushers. Stadium security. The beer guys. Even players. He started interacting with people, making his self-described "obsessive stadium ball-snagging mode" a social affair. Ballhawking was fun again -- still compelling, not as consuming. Hample worked for a minor league baseball team in Idaho, lived in Paris, interned at the American School for the Deaf. He snagged his 2,000th ball on a toss from Joe Roa -- who later added an autograph -- and his 3,000th ball from the Yankee Stadium warning track (glove trick). He researched and wrote a second book, caught Barry Bonds' 724th home run, lent a ball to CBS for a segment with Charlie Sheen, started a cottage business in which aspiring snaggers accompany him to games, learning the tricks of the trade. He never did settle down with an office job, sitting in a cubicle all day, spending his evenings chitchatting at cocktail parties. The mere thought makes him antsy. Hample often feels like the world's biggest 6-year-old, like he has "unofficial ADD times 10." Nearly a decade ago, Hample set the world record for high score in the 1986 blast-'em-up arcade game Arkanoid. Correction: Hample broke his previous world record by racking up 1,658,110 points in a play session that stretched a single quarter across two hours. "Where do you draw the line between obsession and passion?" Hample says. "You can't be a master of anything if you're not obsessed. I'm not saying put me on a level with Tiger Woods. I just think you can't achieve greatness without devoting yourself." Hample grins. He mentions that he used to get made fun of at sleepaway camp. All the time. "On a very small scale, and not to be cocky, but I know what it means to be the best in the world at something," he says. "It's a cool feeling." Hample is hawking blind. Can't see the batter, can't see the game, can't see anything save a couple dozen beer-drinking fans leaning on the fence above the right-field warning track. We've come to Oriole Park's standing room only section, where Hample hunches by a large metal trash can, glove on his hand and hands on his knees, under a green and white sign reading WATCH OUT FOR BATTED BALLS. An alcohol compliance officer in a bright orange shirt walks past, casing the fence-leaners. Hample points to one of them, a fellow ballhawk named Erik, also with glove, standing on his tiptoes. "He's making a common mistake," Hample says. "Maybe it works for him. If he gets a short home run, he's all over it. But anything deep ... "
Hample gestures to the rather large and imposing foam-padded flagpoles dotting the right-field plaza, each topped with an American League team flag, an obstacle course of potential Grade 1 concussions.
" ... and I've got it. It's easier to move forwards than backwards." Like a manager making a late-game switch, Hample is playing the odds. He always plays the odds. Has to. Game-used balls don't come easy. A third out ball -- that is, when a player flips a baseball to fans above the dugout -- happens once a game. A foul ball happens every other game. A home run? In all his years of chasing baseballs, Hample has caught nine of those, ever, one with a self-imposed asterisk. (The ball bounced on the field and was tossed to Hample, which he dubs an assisted play.) Balls are the product of circumstance, he says. And so he runs. Probably more than most of the players. (Now I understand the Thai noodles: needed carbohydrates.) 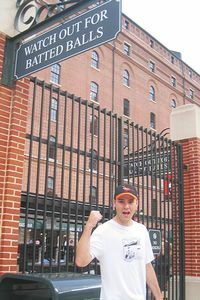 Hample scampers around Oriole Park until his shirt is soaked with sweat and -- what the hell? -- dirt, dodging peanut vendors and red-faced fans with tottering trays of beer. He spends an inordinate amount of time pretending not to run, too, the better to pacify scolding ushers. When a left-handed batter such as Oakland's Adam Kennedy comes up to bat, Hample stations himself in a concourse tunnel, behind home plate and to the right, the best spot in the stadium to snag a foul ball; when a right-handed batter comes up, he moves to the opposite tunnel; when a power-hitter like the A's Jack Cust digs in, Hample sprints along the aisles to the SRO section in right. (In this regard, he probably trumps Billy Beane as a "Moneyball" beneficiary: Increased major league plate discipline means more time to shuttle back and forth without missing a batted ball.) Hample can tell you the best ballparks to catch fouls (Milwaukee, Arlington) and the worst (Philadelphia, a "crowded place with no aisle, and it's not like I've lost my athleticism"), plus the one place where changing into the road team's jersey will get you pushed and elbowed (Yankee Stadium, either iteration). He has scouting reports on players and ushers. (Of one Oriole Park usher: "She's trouble." Shaking hands with another: "Nice guy. His name is Lamont.") If Hample can't see the action on the field, he'll have his girlfriend, Jona, flash him hand signals. "People e-mail me, 'Who are the nicest guys to throw balls?'" Hample says. "I always say, 'Don't focus on the players. Focus on the situation.'" Back among the right-field flags, Hample waits. He studies the foul pole, the same pole that once robbed him of a Nick Markakis home run. A pause in the game. The Orioles are changing pitchers. Please be a righty. A right-handed reliever would increase the chances of the A's deploying left-handed batters, in turn upping Hample's chances of snagging a homer. He runs to the fence. No! "A lefty!" he says. "Mark Hendrickson. Mark effin' Hendrickson." Hample pulls a homemade team roster out of his pocket. If not for Hendrickson, the next batter would have been left-handed. He shakes his head. "The home run gods are against me." Maybe so. But not during batting practice. A few hours earlier, I spot Hample in the left-field stands, three rows above the 364 FT wall marker. He waves, promptly ignores me. Someone on the Orioles is hitting bombs. Two balls land near Hample, one after the other, smacking against the green plastic seats. Hample collects both. He flashes three fingers. Another ball lands behind him. Two other fans converge, but Hample beats them to the prize. (Hustling from row to row, he is deceptively, disturbingly fast. Like, magic fast.) Moments later, he catches another ball on the fly, right in his glove. "What's the most you've ever gotten in a game?" asks Matt Hersl, a 43-year-old city employee who works down the street. "Kansas City. That's what happened." A fly ball sails overhead, hitting the concrete steps behind us before ricocheting onto the field. "I misjudged that one," Hample says, surprisingly nonplussed. "One thing that makes me feel better is that if you watch a major league outfielder, even he will be drifting to the last second. He'll break a step the wrong way. Out here in the seats, I don't have that luxury. I have to dodge seats and the railing." The Orioles conclude BP. The A's are forthcoming. Hample changes into a green Oakland shirt. So does Erik Jabs, a Spanish teacher from Pittsburgh who founded the online ballhawk league, which tracks Average Balls per Game, Balls Caught by Device and other metrics you've almost certainly never heard of. Looking around, I notice a half-dozen kids pulling the two-shirt trick. This is what Hample hath wrought. Jabs says he's working a 71-game streak, and that he once rolled his ankle chasing a ball. Hample counters that he previously cracked a rib. "Zack's the king of ballhawks," Jabs acknowledges. The sun slips behind the upper deck. The left-field seats are filling up. The King of Ballhawks is getting antsy, stuck on eight balls. He paces his row, tugging his shorts, no room to run. Too many bodies. An usher leads a family of five to their seats. Hample has to move. Who comes and sits in their seats during batting practice? He asks an Oakland player for a ball in Spanish. The player flips a ball to someone nearby. All around, fans are jabbering on cell phones, hooting and hollering, exchanging fist bumps, excited if a ball lands anywhere near them. Hample is quiet. Stone-faced. He points at an usher. "If she doesn't look over here," he says, "I'll have a ball in two minutes." Between the bullpen and the left-field seats is a concrete walkway, a 20-foot drop from where we're perched. Atop the walkway lies a baseball. Hample stands on a seat, leans against a chicken wire safety fence. Trick time. He lowers his glove, string attached. It hits the ball ... but pushes it farther away. Hample winces. Horrendous, he says. I just botched it. A cop walks through the bullpen. "Sir, may I please have a ball?" No luck. Hample peers through the fence. He looks up. Looks down. Nobody's watching. He sticks a marker back in his glove. Lowers it again. Closer ... closer ... almost there. The usher approaches. "Young man, may I see your ticket, please?" Defeat. We retire to the seats above the Oakland dugout, gulp bottled water, take a breather. Hample lays out his dream: sponsorship for a full season, maybe from a glove company. Five games per stadium. A thousand balls. For charity, of course. He scans the field. Oakland's coaches and catchers are tossing balls down the left-field line. Sometimes, he says, he still feels like he could be down there. Like he was meant to be a ballplayer. If you can't reach the highest level of something, why do it at all? "What would Adam Kennedy be if he wasn't a ballplayer?" Hample says. "And then I realize, you're looking at it. I'm the answer to my own quest -- "
Kennedy emerges from the dugout. Hample makes a beeline, A's shirt yanked over his shoulders. "Adam, right here!" Ball No. 9. He jogs to the coaches. Checks his pocket roster. "Hey Ron! Toss one up!" Oakland bullpen coach Ron Romanick happily obliges. Ball No. 10. Hample returns with his tongue jutting out -- first strutting, then dancing along the aisle. "I got my 10!" he says. "As I should have." "But again, I should be at 11 or 12 now." About that cracked rib: The injury happened in Anaheim, about a year ago, and did not involve: (A) running into another ballhawk, (B) falling over a safety rail while performing the glove trick, (C) getting beat up after swiping a ball from a little kid. No, the rib was pure stupidity, entirely Hample's fault. (His words, not mine.) Hample was working the right-center seats during batting practice, no one within 20 feet. A ball went over his head, landed a few rows behind him. It bounced. Trying to snag the rebound, Hample lost his balance, then fell sideways into a metal armrest. "I can't remember if I picked it up off the ground, but I got the ball," he recalls. "My 1,000th ball outside New York." "It was totally not worth it," he says. "It hurt! The worst pain I've ever experienced in a baseball situation." Reaching for a ball at Yankee Stadium, Hample tore off a thumbnail. A tipped home run ball once hit him in the face, breaking his nose. ("Slightly," Hample clarifies. "The whole thing wasn't disintegrated.") He shows me a yellow-purple mark on his leg, a two-week-old bruise produced by the wrong end of a folded-down seat. We're sitting under the Oriole Park upper deck, waiting out a rain delay. Hample is eating pizza. Milli Vanilli wafts from the stadium P.A. system -- softly, painfully -- while out on the field, the infield tarp glistens under the lights. "Wow," Hample says, "this is beautiful." "Also, players are going to have to warm up their arms. I might get a ball out of this that I wouldn't otherwise." The rain subsides. The grounds crew emerges. Tonight is Hample's 41st game of the season. Years ago, he would attend 80-plus. He used to show up solely for batting practice, focused and determined, far less mindful, hurdling railings and jumping seats, gobbling balls like Pac-Man. No longer. He's getting older. He has his girlfriend, his blog, the ballhawk community, a third book underway (about baseballs, of course). He makes a point of giving away balls, particularly to children. He has a growing appreciation for the moment, a far greater appreciation for game-used balls -- each one a memento, a tangible reminder of beating the odds. "They are so hard to get," Hample says. "Game home run balls are the holy grail." Baltimore's pitchers come out of the bullpen, make their way across the outfield grass. Is Hample obsessed? Strange? I'm not sure he's all that different from the ballplayers below -- or from the rest of us. Everyone scheming and sweating and striving. Everyone at the mercy of fate -- a baseball falls your way, or it doesn't -- yet still determined to massage the odds, to bend the long arc of luck toward opportunity. "I wonder if those guys have a ball," Hample says. "Ahhh. The ushers won't let me all the way down there, anyway." Hample narrows his eyes, unblinking. "Oh my God! He has a ball in his hand! Let me out!" Hample scrambles down the concrete steps, glove in hand. From the still-soaked lower concourse walkway -- a good 30 feet from the field -- he gestures frantically, a man with a plan and a cheat sheet in his wallet. Throw me a ball! Right here! Throw it to me! The world will always belong to those who swing from the heels. As for the balls? It helps to know a little Swahili.